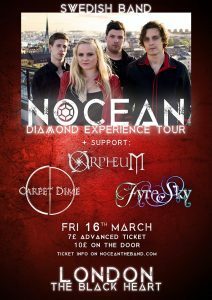 We’re pleased to announce that we’ll be supporting Nocean for the London date of their “Diamond Experience Tour” in 2018! It takes place at The Black Heart in Camden on Friday 16th March and we have a limited supply of special price tickets for the night. Head over to the Official Orpheum Store now to get yours before they go! Get your limited ticket HERE! We want to say a huge thanks to everyone who came to the Tower of Song for The Quinphonic Festival 5 this past weekend! It was so great to see and chat to so many familiar faces and meet many more. You made the day special for everyone, so thank you! It was a great pleasure to be part of this festival and share the stage with four incredible bands who all had amazing sets; WEEND’Ô, Zephyra, Alia Tempora and Wildpath! The biggest thanks, especially with all the hard work and last minute work that went in from Ian Black, Phil Wooldridge, Jacqueline Wolff and all at the venue for having us and making the day run so smoothly, including Matt Bough and co for the great sound! We couldn’t have done this without our brother from another mother (sort of!) Noah Scott from Evyltyde who I hope you agree, felt like we’d been playing together for far longer! An awesome guy and bass player, so we were so glad to have him with us.